A number of people struggle to boil eggs perfectly. Sometimes they remain half-boiled and sometimes they are over boiled and cracks appear in it. Is there a perfect method to boil eggs without cracking it ? Yes there is a method, and we will explain it to you so that you can make hard boiled eggs without making it crack. Never use fresh eggs to boil. Buy eggs and keep them in fridge for 7 to days and them use them for boiling. 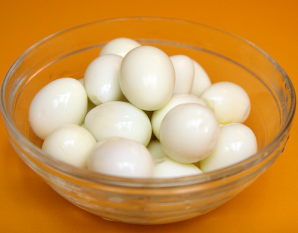 While boiling eggs use only a single layer of eggs in pan. More than one layer can make them crack. Cover them with one inch water. Let the water boil and then switch off the heat. Cover the Pan an leave it for few minutes. Time to leave the eggs in this condition depends on their size. Now put these eggs in cold water for a minute. It will make it easier for you to remove the shell as due to cooling effect outer shell loses the internal part. You can also roll the egg between your hands to loose the shell. If you want to store hard boiled eggs, then don't peel them. You can keep them in refrigerator for one week. Once peeled, you should eat it on the same day. Precaution: Never try to boil eggs inside microwave. It may make them explode due to steam produced inside the shell.